Vegecat™ supplements have allowed cats to be vegan since 1986! *To learn more about the formula update, please CLICK HERE. All recipes include food yeast. We highly recommend using our VegeYeast, a brewer’s yeast modified for acidity. Maintaining an acidic urine pH is important. The ideal urine pH for a cat is 6.0 to 6.5. Urine pH can be tested at home or at a veterinarian’s office. 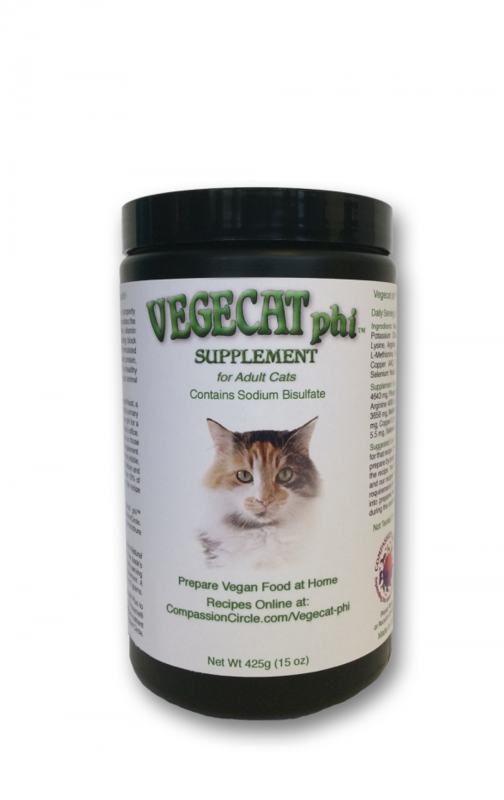 Vegecat phi™ is formulated for cats who cannot maintain the proper urine pH using the Vegecat™ supplement. Wet food is best for the urinary health of cats. If you primarily feed dry kibble, it is best to add moisture to the diet. Pureed vegetables add moisture and additional vitamins and minerals. Veggies should be no more than 10% of the diet to ensure the protein requirement is met. Please see the recipe instructions for more information. The Vegecat phi™ recipe brochure accompanies the Vegecat phi™ supplement, and recipes are available online at www.CompassionCircle.com/Vegecat-phi. Please read the introductory portion of the recipe brochure thoroughly before preparing meals. Suggested Adjuncts: For optimal health, add lactose-free Prozyme® Plus to every meal. A 10.5 ounce bottle will last one cat for 32 months. The digestive enzyme amalyse is particularly important for cats on a plant-based diet. Prozyme® Plus is available through Compassion Circle.